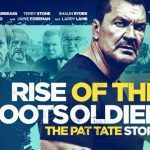 The critics rarely have a good thing to say about low-budget British gangster films, and Rise of the Footsoldier 3: The Pat Tate Story is no exception. But what the heck? Some pretty lively car stunts were filmed in Croydon on Vulcan Way. Not bad. FilmFixer manages the film office service for Croydon. FilmFixer director Andrew Pavord says, “The stunts were filmed in an industrial area, well away from residents, by a crew who made sure to keep it all very quiet.